Offer the possibility to your customers to pay their orders in multiple installments. 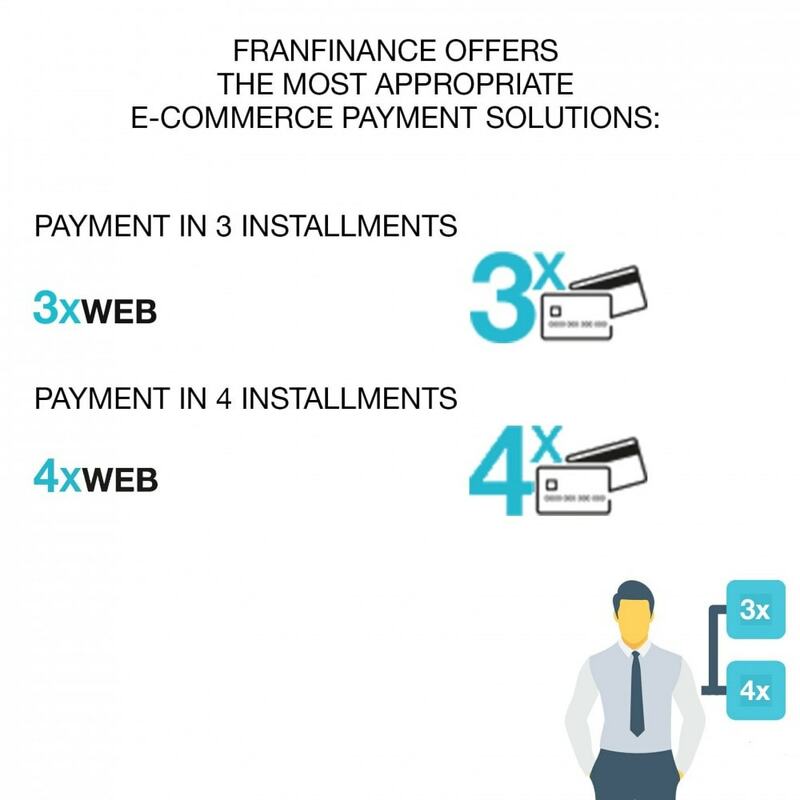 3XWEB and 4XWEB payment solutions are provided by Franfinance. Boost your sales and have total control of unpaid debts. Our module includes 3XWEB / 4XWEB solutions and Sprint Secure. 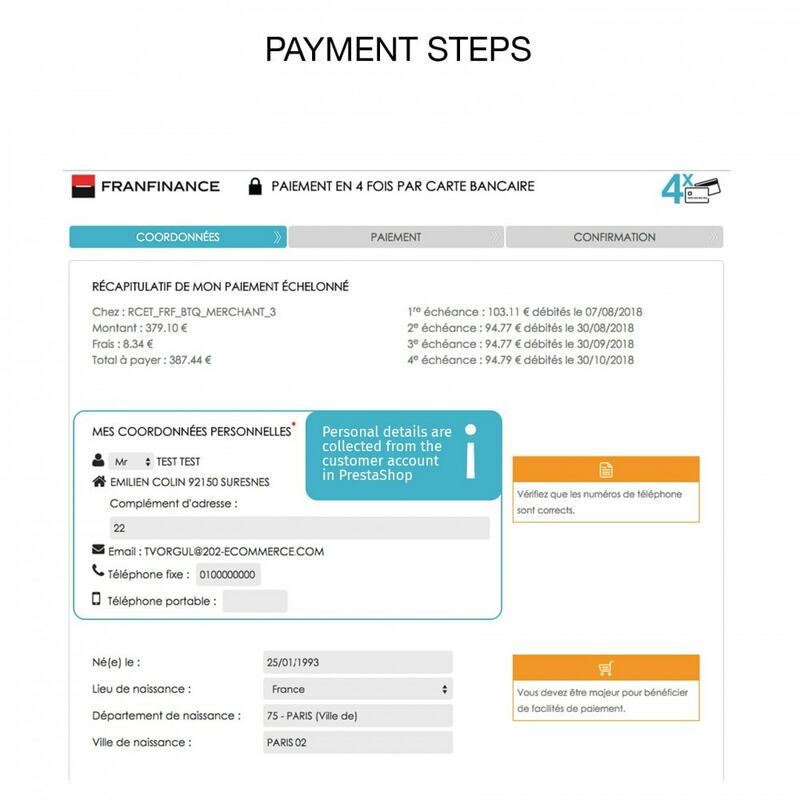 The Franfinance module allows you to provide the most suitable payment options to your customers: payment facilities for 3 or 4 times payment by credit card. The expansion of payment options will increase your average checkout amount and customer loyalty. Your payments are 100% secure: all risks are covered by Franfinance. 3XWEB: payment in 3 installments for purchases between 100 € and 3000 € (the threshold and the ceiling are modifiable depending on the service you want to bring to your customers). 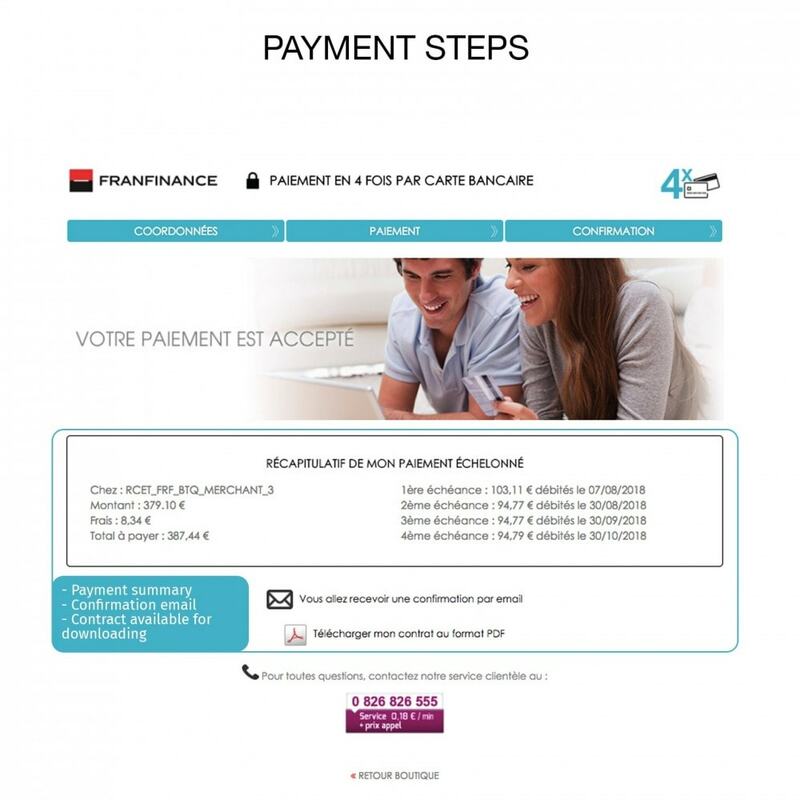 4XWEB: payment in 4 times. This offer is accessible 24h / 24h and available for holders of a credit card for purchases between 300 € and 4000 €. 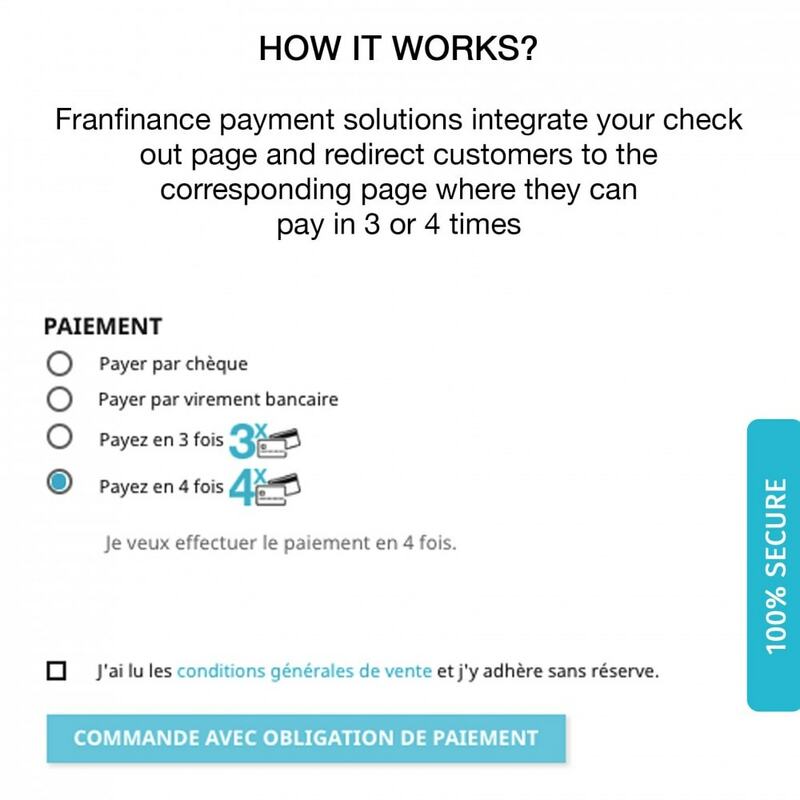 Franfinance's solution integrates in your checkout page and directs the customer to a simple, fast and efficient subscription path that will allow you to increase your average basket, to get new customers and to improve your conversion rate. A team specialized in e-commerce is at your disposal to assist you in the monitoring of transactions. You will have a transaction log and a Franfinance Back Office that allows you to manage transactions on your web site. 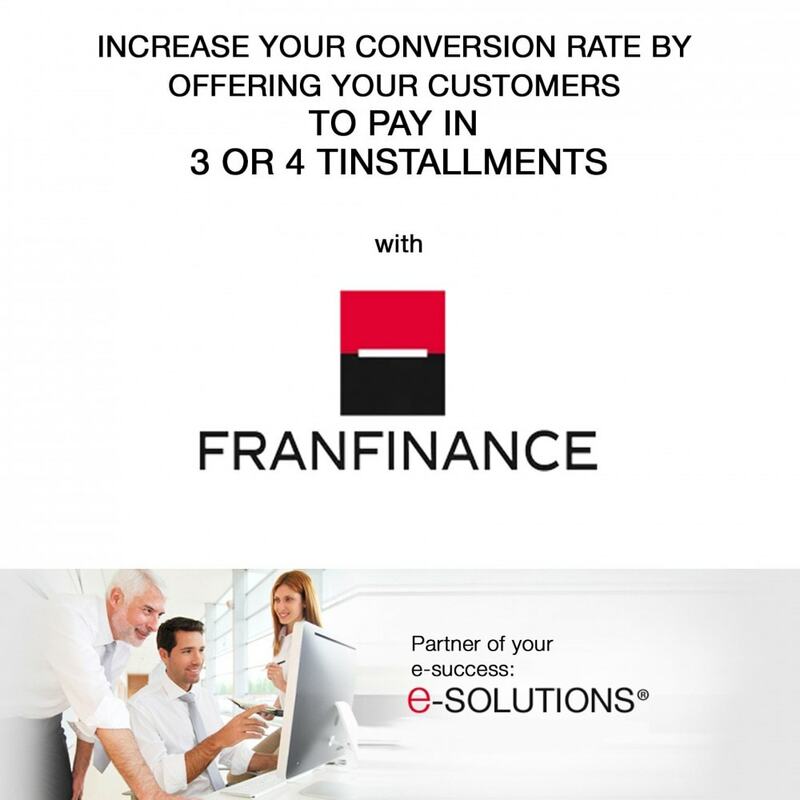 Franfinance puts at your disposal an e-marketing communication kit to promote the multiple times payment on your web site. A daughter company of the Société Générale Group, Franfinance is specialized in consumer credit and is a benchmark in terms of know-how and innovation. 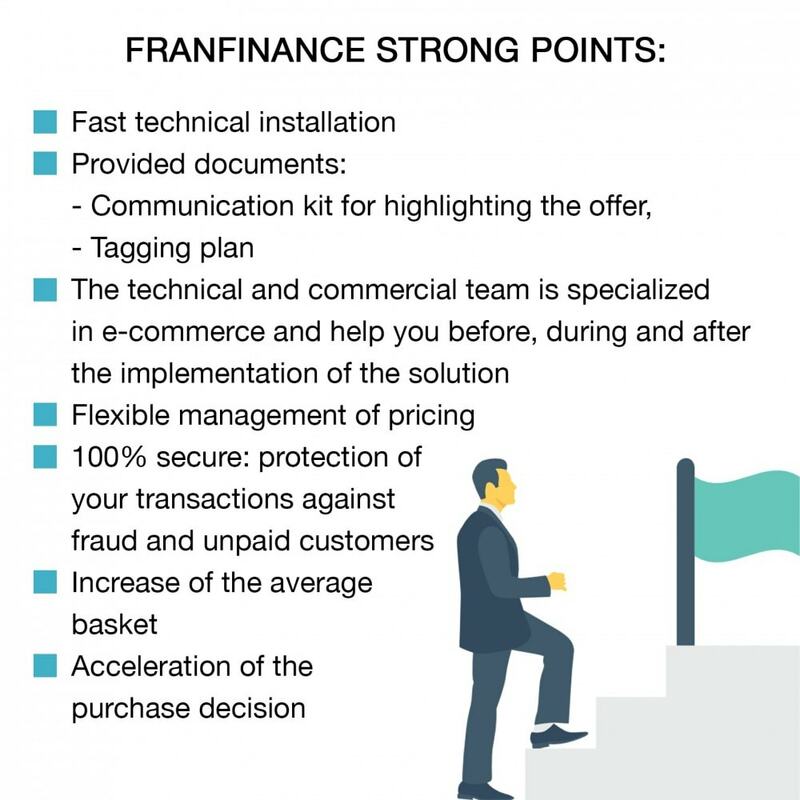 With its hight level experience with individuals, Franfinance offers multiple solutions that meet the needs of its e-commerce partners. You allow your customers to pay their purchases in 3 or 4 times by credit card. There are simple, fast and fully secure financing facilities. 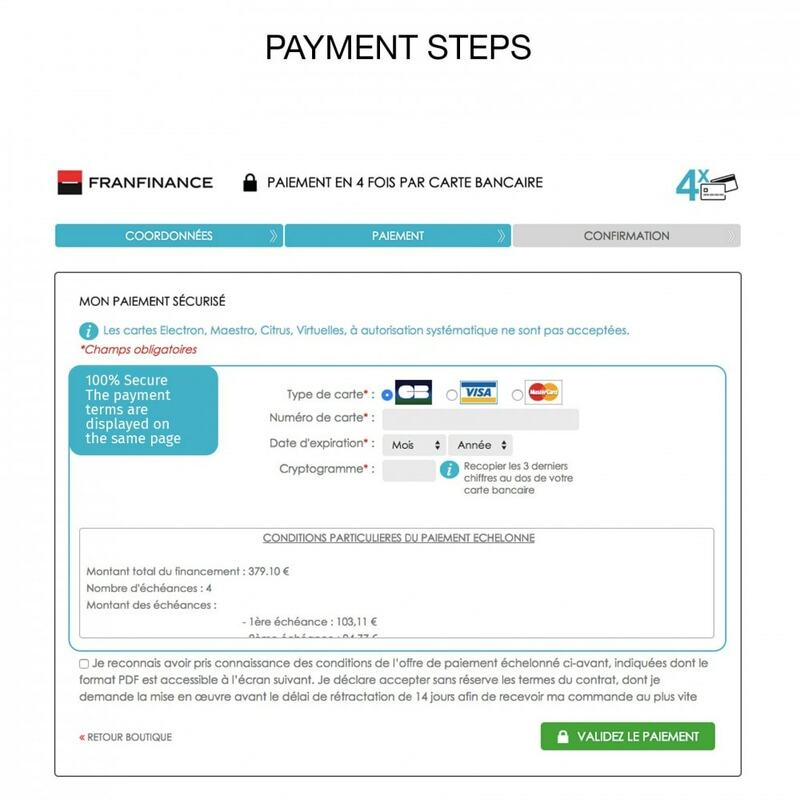 Discover the payment solutions offered by Franfinance on the official website: e-solutions.franfinance.com/nous-contacter by Franfinance. 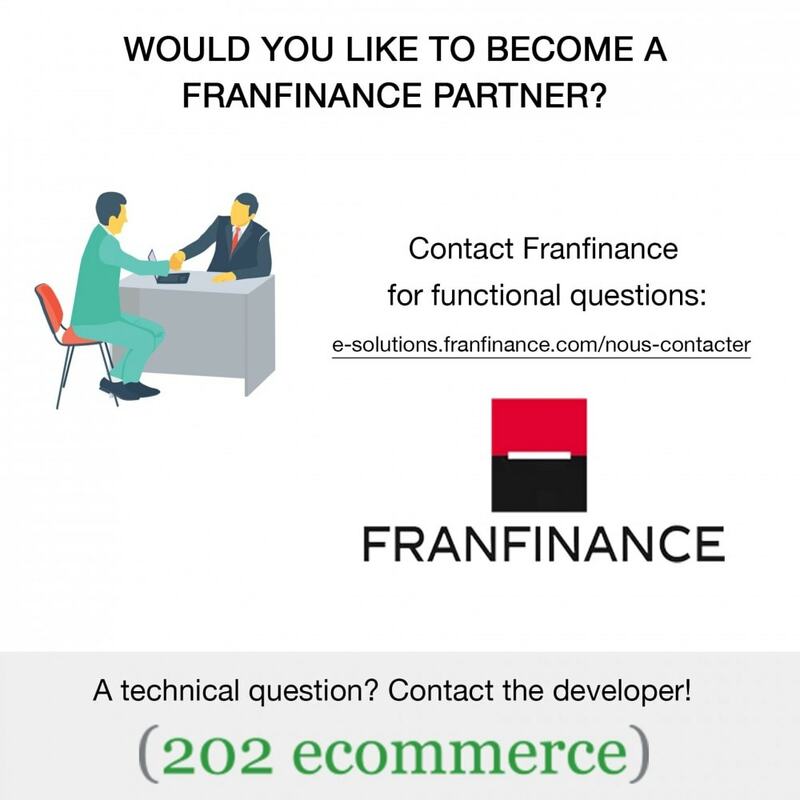 Contact Franfinance via the contact form on their website, by email or by phone before buying the module in order to have more details and become a partner of Franfinance. 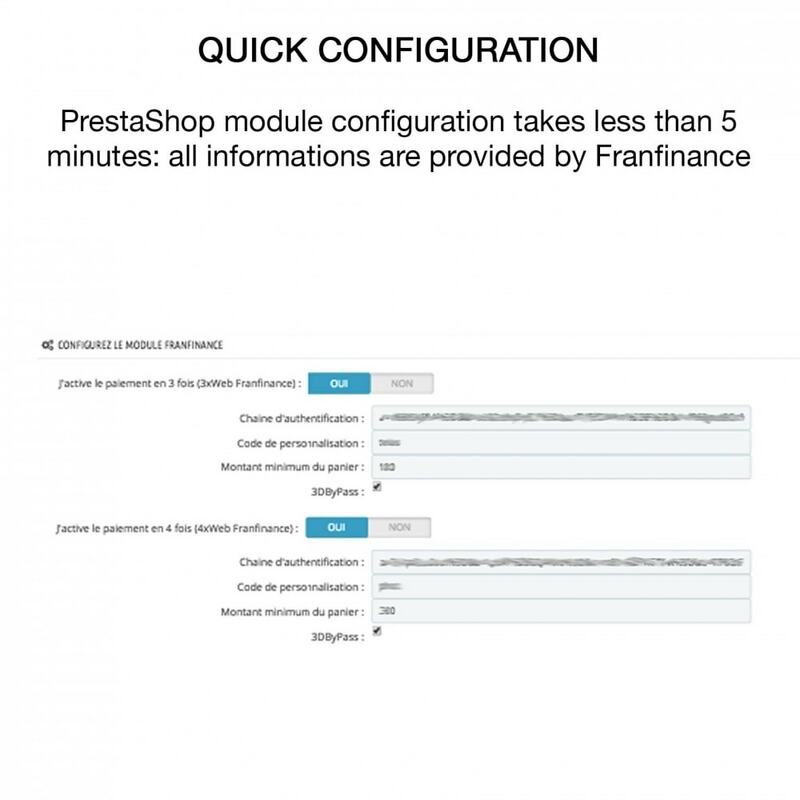 Fast technical installation: Franfinance supports you in the integration of the payment solutions (3XWEB or 4XWEB) on your web site. A technical and commercial team specialized in e-commerce helps you before, during and after the implementation of the solution. Compatibility: PrestaShop 1.5.x - 1.7.x.